We will offer pre-registration at Stereo West Auto Toys later as well! -- Car Show & Spectator entry can be purchased at the gate (Cash Only) day of! The Ice Cream Cruise is for EVERYONE! Young, old, families, domestic fans, import fans, trucks, bikes, you name it! 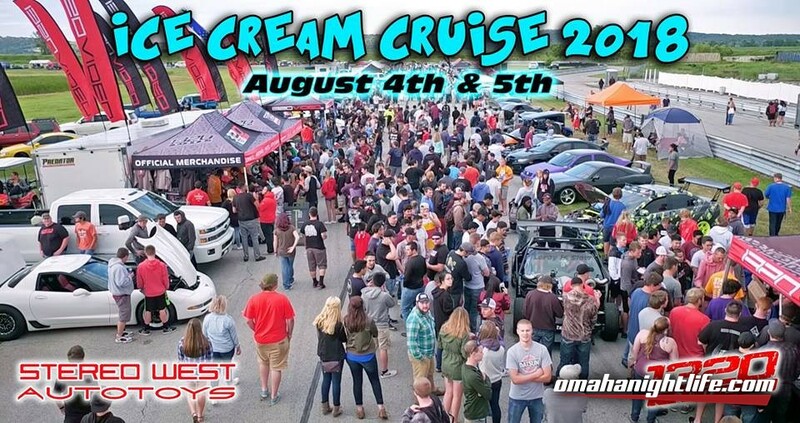 Presented by 1320Video.com & Stereo West Auto Toys, we kick off the weekend with a MASSIVE car show like no other on a 2 mile long road course at Raceway Park of the Midlands on Saturday afternoon. Saturday night we hold our "not so much prep" race on the I29 Dragway 1/8 mile, followed by a day full of racing all day Sunday! We had well over 12,000 people come to the event last year, and expect this year to be even bigger! All of our event merchandise proceeds go to a local charity (currently TBD) - last year we handed a check for $23,356 to Muddy Paws Second Chance Rescue! - We're adding a big tire class to our "Not so much prep race" with 16 spots available! Email 1320video@gmail.com with a photo and details on the car you're interested in entering - we only have 16 spots and will pick the cars that will be most competitive for a good show! SUNDAY (Race Day) - See race details below for more info! Many sponsor & vending packages available - e-mail 1320video@gmail.com for info! Admission is CASH ONLY at the gate - re-entry is only allowed for car show / racers with wristbands, spectators must pay to re-enter if they leave. - - Over $2100 in cash prizes!!! - - Top 50 awarded to our favorite top 50 cars, including our class winners. - To increase your chances of winning, make sure your hood is popped and your windows are rolled down for judges to consider your car inside & out! Schedule to be announced soon, we are pushing to start earlier so the competition can end earlier in the night! We will be selling Ice Cream Cruise merchandise again (found by the 1320Video booth) this year with all proceeds going to a local charity (announced soon)! **Make sure to get yours early, these always sell out! --- Friday night admission prices apply - racing all night 6-11pm! --- Small, contained fires are allowed in camping area. - Food & beverages - Will be available throughout the show all day, please stay hydrated! We're crossing our fingers for cooler weather this year! - Pets on leashes are welcomed & encouraged! - Pit Bikes, Scooters, Mopeds, Groms, (bike sized transportation or smaller) allowed, 5 MPH speed limit strictly enforced. We unfortunately cannot allow for groups (5+) of mini-bikes to cruise with the number of spectators walking the show. - Cruising is prohibited unfortunately, vehicles on the road course must remain parked during the show for safety reasons. - Racing is STRICTLY prohibited anywhere on the property - if you are found racing, you will be escorted off the property. - Grills are not allowed at the show for safety reasons, there will be plenty of food vendors at the show to keep you fed! Saturday's "Not Much Prep" race is an invite only exhibition where we will also present the car show awards from judging in the afternoon. We had some TIGHT competition last year, we highly recommend sticking around for this! $0.00 entry fee - all racers who purchase tech cards are allowed to enter!